gram.Yellow chana dal has slightly sweet taste and nutty flavor. 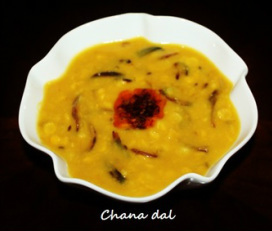 Chana dal is a very versatile it is cooked with different combination of lentils and vegetables like lauki (Bottle gourd) and different tadka is added to dal to enhance the flavor. 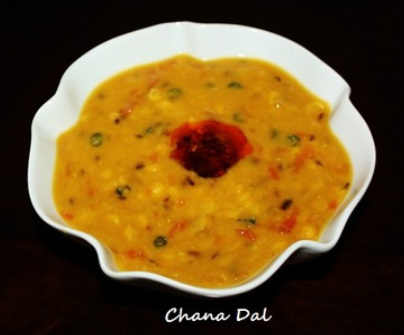 Chana dal has a lovely aroma and it absorbs the flavors of the spices really well. 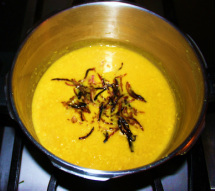 This dal does not boil down to mush that is one of the reasons it is often cooked with urad dal. Chana dal is also used for tampering and cooking meat dishes like shammi kebabs. 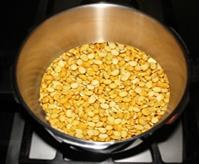 Chana dal is delicious and have very low glycemic index. 1. 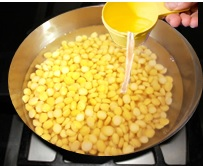 In a pressure cooker add Chana Dal and wash, changing water several times until the water appears clear and then soak Dal in 4 cups of water for 15 to 20 minutes or longer. ​More soaking will not hurt. 3. Close the lid of the pressure cooker, place the weight on the lid and cook on medium heat. 4. In about 8 to 10 minutes pressure cooker will start steaming, turn the heat down and cook for 10 to 12 mintes. Turn the stove off and wait untill steam goes down. spoon mix dal well so that there are no lumps, add more water if need. cook for 4 to 5 minutes. have the desired consistency. Turn the stove off. 1. 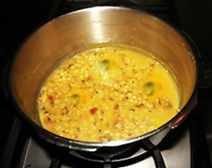 Use pressure cooker for cooking dal, otherwise it takes too long to cook dal. 1. Heat small frying pan, add 1 tablespoon vegetable oil, slice onions and and sauté them on medium high heat for 5 to 6 minutes or until onions become light brown, while frequently stirring them. 2. In about 5 to 6 minutes onions will become light brown. 3. Add chopped tomatoes and chopped green chilies and cook, with the spatula try to mash the tomatoes so that they become soft quickly. In about 5 to 6 minutes tomatoes will become soft and blend with onions. Turn the stove off. 1. In a small pan (tadka pan) add 1 tablespoon oil, cumin seeds and asafetida and fry them for 2 to 3 minutes on medium heat or until cumin seeds become brown. Turn the stove off. Tadkas enhance the flavor of dal, try different kinds of tadka or customize it to your own taste. Instead of adding tomatoes you can add only onion tadka to the dal for variations. 1. Heat a frying pan, add sliced onions and 1 tablespoon of oil and sauté them for 7 to 8 minutes on medium high heat or until onions become dark brown, while stirring constantly.Turn the stove off. 2. 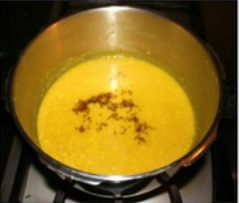 After cooking dal add cumin seed and caramelized onion tadka and cook for five minutes or until you have desired consistency of Dal.